64-bit computing used to be the province of scientists and engineers, but now this generational shift in computing gives all users the tools to apply the power of 64-bit to speed up everything from everyday applications to the most demanding scientific computations. Although Mac OS X is already 64-bit capable in many ways, Snow Leopard takes the next big step by rewriting nearly all system applications in 64-bit code¹ and by enabling the Mac to address massive amounts of memory. Now Mac OS X is faster, more secure, and completely ready for the future. Built-in applications are now 64-bit. The 64-bit support in Snow Leopard makes Mac OS X completely ready for whatever computing enhancements might arrive in the future. 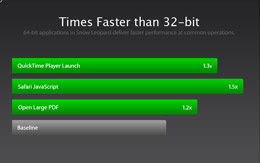 For example, Snow Leopard is ready to support up to 16 terabytes of RAM — about 500 times more than today’s Mac computers can accommodate. That may sound like more RAM than you’ll ever need, but who can predict the requirements of high-performance computers in the future? Mac OS X Snow Leopard comes prepared for anything. 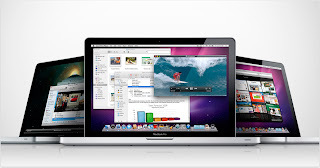 QuickTime X is the next-generation media technology that powers the audio and video experience in Mac OS X Snow Leopard. From Quicktime its inception in 1991, QuickTime has stood at the forefront of video technologies — first with software-based video, then with Internet video. Now QuickTime X takes another leap forward by building on the amazing media technologies in Mac OS X — such as Core Audio, Core Video, and Core Animation — to deliver enhanced playback, greater efficiency, and higher quality.